San Jose police confiscated 2,700 pounds of fireworks as part of an investigation earlier this year to address public concerns about the danger of fireworks, police said Friday. 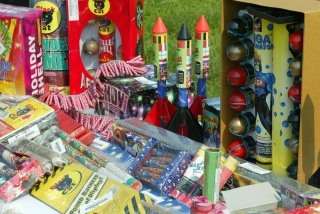 Between April and earlier this month officers confiscated the 2,700 pounds of fireworks as well as 3-, 4- and 5-inch mortars, which are considered explosives. Police said they have identified two people who were allegedly distributing fireworks. One person has a warrant out for their arrest and that person's name will not be released until they are arrested. Police said they will continue to collaborate with other city agencies to suppress the use of fireworks in San Jose. "We recognize and have heard the community's concerns over the dangers and nuisance that illegal fireworks cause, especially as we get closer to the Fourth of July," police Chief Eddie Garcia said in a statement. Anyone with information about the case is asked to call police Lt. Laurence Ryan at (408) 277-4631. People wishing to be anonymous may call Crime Stoppers at (408) 947-7867. Anyone who provides information that leads to the arrest and conviction of a suspect may be eligible for a cash reward from Silicon Valley Crime Stoppers.